Part "Handmaid's Tale," part "Scarlet Letter," part biblical parable. When She Woke is a terrifying look at what life would be like in America if we used the Ten Commandments as a legal code but lost all sense of Christian humility. This fictional Christian society merges the worst of church and state worlds, resulting in judgment without gospel, legalism without mercy, and a church that has so linked itself to the state it can no longer use Jesus' teachings to critique it. Just knowing that much, one might predict that this book will be yet another unsubtle excoriation of American Christianity, painting the church with a broad and sophomoric brush. Thankfully, When She Woke is more nuanced. 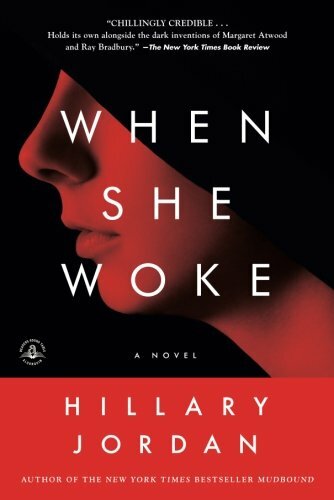 In this dystopian novel—part Handmaid's Tale, part Scarlet Letter, part biblical parable—Hillary Jordan poses questions about everything from prison reform to Jefferson's wall without ever sounding preachy. She lets the plot make the points. The main character is a woman whose adulterous affair causes her to lose everything, while the man in question escapes punishment. The story takes place in a futuristic America controlled by a fundamentalist Christian political party, where the line between a very conservative church and a very conservative state has been erased. Jordan's heroine, Hannah, a sheltered young woman from a working-class family, devoted to her local megachurch, develops a crush on her celebrity pastor. After taking a job at the church's outreach mission, she comes to see that his own seemingly perfect marriage is not without its strains. She falls in love with him and they enter into affair. They sneak off to hotel rooms, take stolen days to be together, but all along he makes it clear that he will never leave his wife because he would never "bring that shame upon her." While the pastor clearly does not put his lover on such a pedestal, Hannah idolizes him. When she suddenly finds herself pregnant, she does not tell him, because he has just been appointed to a cabinet position in Washington, D.C., as the "Secretary of Faith." Hannah does not want to ruin her lover's career and yet can see no way to raise their baby alone. Single motherhood would not be an option, given that her family would not rest until they got the name of the father, to prosecute him for adultery, now a crime. So against her own beliefs, desperate and alone, Hannah seeks a back-alley abortion. Abortion is also a criminal offense. Hannah is caught in a police raid, and because she refuses to give up the name of her lover or the doctor who performed the procedure, the whole weight of the criminal system falls on her. In this fantasy future, the Christians have done away with capital punishment. Long prison sentences have been replaced by "chroming," in which criminals are injected with a virus that turns their skin a bright color, with a different color for each category of crime. After a month in solitary confinement, Hannah is released to spend the next forty years roaming the streets with bright red skin. Everywhere she goes, she is visible for her crimes, spat upon, beaten, screamed at, and threatened. The author uses chroming as an obvious metaphor for racism and profiling in the real-life American penal system, and it works. In a clever twist, chroming allows Jordan's society to judge someone by the color of their skin and actually be "right" about it. But of course, in telling the story of one who has been chromed, we see how much more complicated it is. One of the strengths of When She Woke, is that while the author obviously hates the fictional world she has created, she doesn't hate the characters who made it that way. Throughout the novel, ordinary people respond better than expected. While chroming brings out the brutality of the self-righteous, there are others who live out their faith the way Jesus would, and reach out to the most despised. Jordan also helps us understand the reasons her country got this way. She explains that the world has been traumatized by a sexually transmitted disease called the "scourge," which left a large percentage of the world's women infertile. So naturally, abortion came to be seen as the worst of all crimes. Hannah is hated by men and women alike, for her decision to abort in a world that is short of children. There are many nods to the biblical world—most notably, stories of women being stoned for adultery while their male counterparts go free. While the men are supposed be held accountable, in When She Woke, as in so many biblical stories, it's the women who bear the evidence and therefore the women who get caught. In the gamble of adultery, when you have a society in which women have no access to birth control, the playing field is far from equal and the stakes are highest for the one with the least power.